MagTek, Inc., the world’s leading supplier of secure payment technology, today announces the launch of the oDynamo, MagTek’s newest OEM Secure Card Reader Authenticator. The oDynamo provides reliable and secure reading of magnetic stripe and chip card data, MagTek’s oDynamo is the ultimate card reading component for the growing unattended payment terminal market. Designed to fulfill the wide-ranging needs of gas pumps, ATMs, vending machines and other unattended payment applications, the oDynamo is an ideally suited solution to these demanding business verticals. Built to be highly connective, the oDynamo supports multiple communication protocols and offers a host of interfaces including USB, UART and Ethernet. MagTek’s oDynamo also easily integrates with PIN pads and NFC modules. Unattended payment terminals need to function in the most challenging environmental conditions. The oDynamo is built to meet these challenges. Housed in a sealed chassis, MagTek’s oDynamo is impenetrable to liquid and other harmful environmental elements. The oDynamo delivers anti-skimming technology in a Tamper Resistant Security Module; making PCI-PTS compliance and SRED certification even easier. For more information about MagTek and oDynamo, please visit our web site at https://www.magtek.com, or see us at PEI at the NACS Show 2017, at McCormick Place, Chicago, IL, October 18 – 20th, Booth # 7585. Since 1972, MagTek has been a leading manufacturer of electronic devices and systems for the reliable issuance, reading, transmission and security of cards, checks, PINs and other identification documents. Leading with innovation and engineering excellence, MagTek is known for quality and dependability. Its products include secure card readers, check scanners, PIN pads and distributed credential issuing systems. These products are used worldwide by financial institutions, retailers, hotels, law enforcement agencies and other organizations to provide secure and efficient electronic payment and identification transactions. 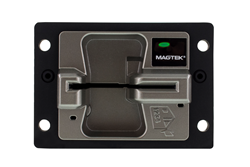 Today, MagTek continues to innovate with the development of a new generation of security centric products secured by MagneSafe™. By leveraging strong encryption, secure tokenization, real time authentication and dynamic payment card data, MagneSafe products enable users to assess and validate the trustworthiness of credentials used for online identification, payment processing, and other high-value electronic transactions. MagTek is based in Seal Beach, California and has sales offices throughout the United States, Europe, and Asia, with independent distributors in over 40 countries. For more information, please visit http://www.magtek.com.